Some people will see lights or visions or special forms in the light. Some will even hear voices in their head. That's what usually causes you to hear sounds or see visions due to spiritual practice. These are common experiences that occur when the chi tries to pass though the difficult hind region of the skull, which is called the "jade pillow" in Tao school literature. External visions and voices can be misunderstood. Even saints have misunderstood what God has said to them. Divine communications of an intelligible kind have to be filtered through the human psyche and one's cultural conditioning. The Zen school, commenting on this type of experience, always says simply to ignore it because it is all mara, or illusion anyway. Telling people to ignore this type of event serves a double purpose as well, for it's only by ignoring mental states -- meaning to refrain from clinging to them -- that you can pass through them and reach higher spiritual states of knowing. Remember that the rule of spiritual practice is cultivating emptiness all the way. You cultivate emptiness of discriminative thought through detachment. Another way of saying it is that you cultivate emptiness through "contemplation," the practice of watching without clinging or involvement that can evolve into spiritual wisdom. If one has enough bodily strength and the chi ascends to the back of the head, one may notice darkness in front of the eyes when half asleep. Gradually a dreamlike state occurs, and images eventually appear. This happens because chi affects the nerves at the back of the head, which then affects the optic nerves. Many people have dream images accompanied by feelings of love and joy or sadness and dread. These images and feelings match subconscious functions which give rise to one's mental states, thoughts and concepts. States of Mara, or demonic delusion, may occur at this stage. These states depend upon one's wisdom, thought, personality, psychological propensities, and physiological condition. They are very complicated. Without the guidance of a very perceptive master, and in the absence of self-confidence, healthy intelligence, and correct thinking, a person may be led down the wrong road. When chi reaches the back of the head, a person might hear wonderful inner sounds or experience ringing or pressure in his ears. This phenomenon is produced by chi working to open the chi route in the brain. The vibration or trembling of chi causes some brain wave activity. If one's intelligence is not clear and bright enough, then illusions deep inside the subconscious will result. 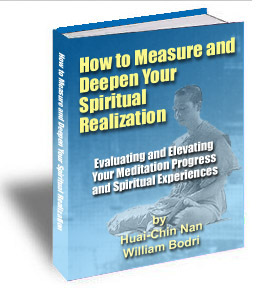 One who has deep religious beliefs may have illusions of hearing the voice of God or Buddha. Often the voice will speak of the past or future, and this a priori information may be quite correct, at least in small things. Thus, one might believe he has clairaudience. Whatever is heard is actually just a big assembly; it is a mixing of previous experience--what has been seen, heard, thought and known before. This kind of clairaudience could be used to predict small matters, but it will not work on big events at all. If one clings to the idea that these voices are real, he will fall into a state of Mara, or illusion. This shows that the mind is receptive to impressions but this is not a genuine instance of clairaudience. A person should not be puzzled or moved by this reaction. Instead, he should sometimes swallow the saliva and release the feelings in his head. This requires a strong mind and persistent will. By guiding the chi downward one will pass this stage and enter the next. Consider the following: if all the great deities in every direction were to appear before you during your meditation or in regular life, what good would that be to you anyway? These guys can't make you enlightened, for you still have to do all your meditation work yourself. What can they ultimately do for you? If you think they could save you, they would have done so already so seeing them is of no benefit. If they cannot save you, then all the work to be done in spiritual striving still rests squarely in your own hands. Remember that fundamentally you are already saved anyway since you are already that fundamental enlightened nature. In fact, Christianity and Buddhism and all the other religions say you are already saved, but if that's the case then what is the point of spiritual efforts? It's work you have to do yourself to get to that state of realization. It's work you have to do to realize the Tao, to understand the Tao, to see the Tao. Higher beings cannot give you that realization; it's your mind so you have to work hard to realize it yourself, and you can only experience it by freeing your mind of thoughts and sensations. Hearing things in your head or seeing visions isn't the path to realizing your original nature, so those sorts of things are of no use. Milarepa, of Tibetan Esoteric Buddhism, even said so to his student Gampopa. Basically, these sorts of experiences all fall into the realm of samsara or illusion. Thus we have the wonderful saying from the Zen school, "If you meet the Buddha on the road, kill the Buddha." This means you have to avoid clinging to thoughts and images -- even holy ones -- and avoid taking any of your experiential realms as the Supreme. If you give rise to a thought, even a holy one of the Buddha -- kill it or liberate it into emptiness. Don't hold onto it but let it go to regain that ultimate natural state which is the real nature of your mind. It's empty but able to give birth to reflective wisdom that sees without substance. All these things that arise are just creations of the mind, projections of your original nature without any true essence in themselves. If an illusion arises in the mind, just "kill it" by letting it go and in that way you'll finally awaken. Don't ever take what arises in your mind as a holy sacred. What you're really looking for in meditation practice is to realize that true fundamental essential nature of your own mind rather than all these other unusual phenomena--even though they may be wondrous mental states that rise to thrill you. Whatever arises that you cling to or worship is just another illusion ready to cheat you. These states don't arise with the specific intention to cheat you, but we cheat ourselves in taking them to be real.